This tour offers a wide variety of stops that will delight and amaze you and takes you to places off the beaten path! Enjoy great conversation in our tour van along the way to the first stop, the SS Atlantic Heritage Park, a place that is skipped over by other tour companies. Many do not realize that the sinking of this vessel in April 1873 was the worst single-vessel marine disaster to occur prior to the Titanic. You will have time to visit the interpretation centre to learn about the sinking and see artifacts from the ship and then walk out to the memorial and enjoy the peacefulness and picturesque scenery of the bay. 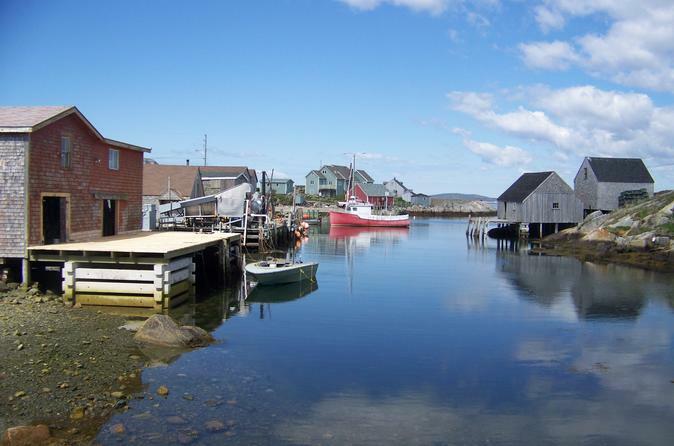 Then it's onto Peggy's Cove, passing scenic fishing villages and gorgeous shorelines along the way. Once at Peggy's Cove, you'll be able to have time to browse the various gift shops and capture the waves as they crash on the rocks in front of the world's most photographed lighthouse. Just a short drive away from Peggy's Cove, is the Swiss Air Memorial, a beautifully designed memorial for the 229 victims of the Swiss Air Flight 111 in 1998. Big tour companies can't stop here because of the small parking lot so you'll be able to enjoy this stop free from the crowds. Included in the tour is a tasty lunch at The Finer Diner, overlooking beautiful Hackett’s Cove.Savour one of their delicious Lobster Rolls (other sandwiches are available if you're not a lobster lover) before heading back to Halifax. Once back in the city, you'll visit the Titanic Gravesite to learn about the disaster and the stories behind those lost in the sinking. Then you'll see another great sight that the larger tour buses cannot access - the Hydrostone neighbourhood! This area was built after the Halifax Explosion of 1917 and you'll learn just how disastrous this was to the city. It's another part of history that is overlooked by many! The tour concludes with drop off at your accommodations.